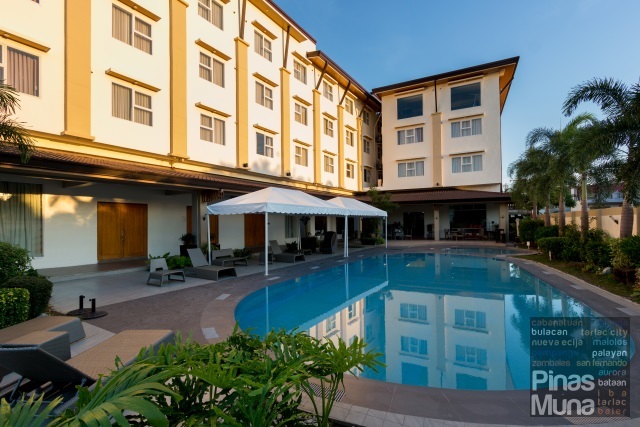 The Harvest Hotel is a mid-range business hotel strategically located in the commercial district of Cabanatuan City, Nueva Ecija. The hotel opened in 2014 and is currently the newest hotel in the city. 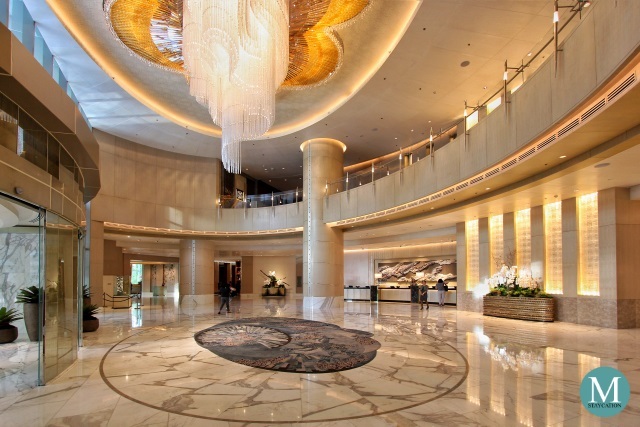 It has a total of 81 guestrooms, suits and lofts. 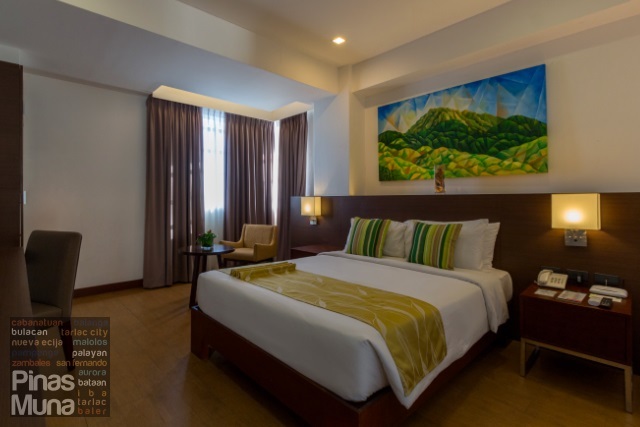 The hotel caters primarily to business travelers, and is also the preferred hotel of leisure travelers and balikbayans. 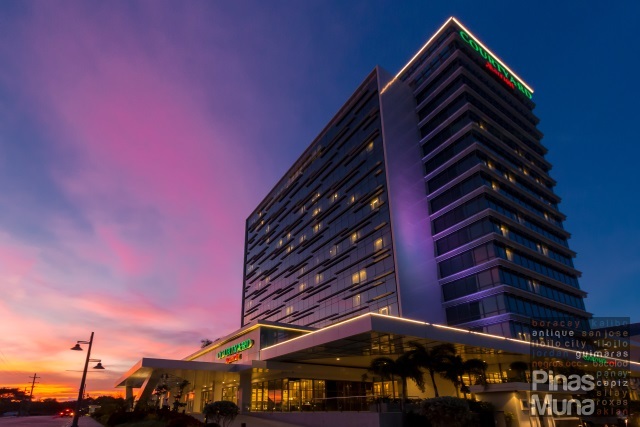 The Harvest Hotel is a 100% Filipino hotel brand which is currently managed by Hospitality Innovators Inc (HII), the same hospitality management company behind The Picasso Boutique Serviced Residences in Makati City and Azumi Boutique Hotel in Alabang. Check-in was quick and very efficient. After filling-out the guest registration form, we were assisted to the Lobby Lounge and were served with welcome drinks. We enjoyed the refreshing ice-cold cucumber lemonade while waiting for our electronic key cards to be issued. We stayed at room 216, a Standard Twin Room located on the second floor of the hotel. 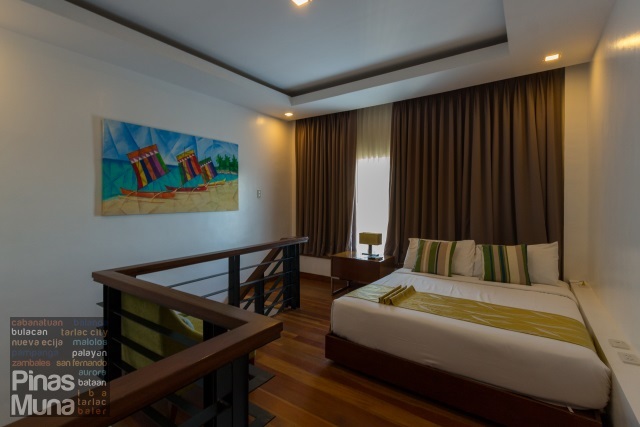 The room measures 29sqm which is comfortably spacious for two persons. 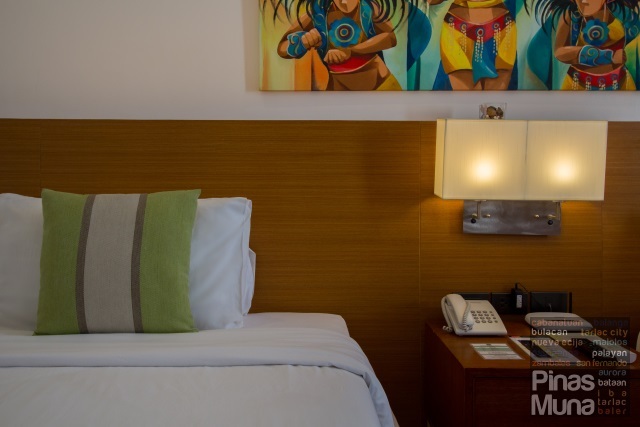 Our room is furnished with twin beds, a writing table, and a wardrobe cabinet. 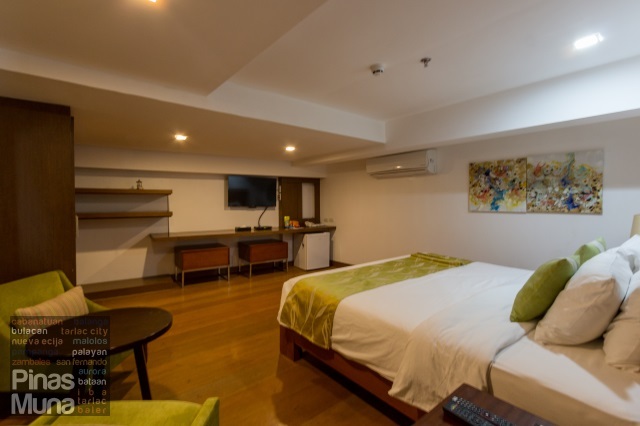 The room is equipped with individually controlled airconditioning unit, an LCD television with local and international cable channels, and an in-room wifi router. 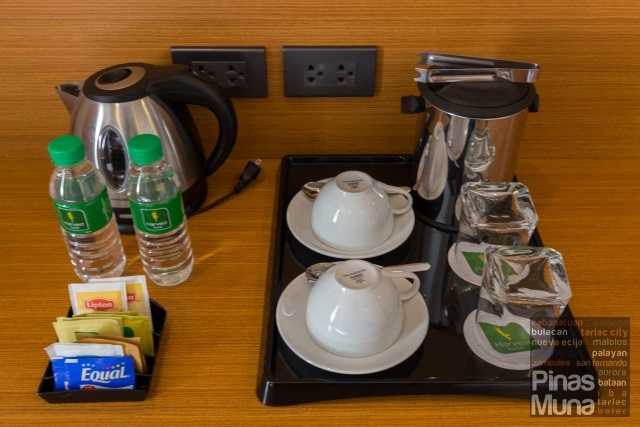 There's also a coffee and tea making facility, a minibar and an in-room safe. Giving a distinct Filipino character to the room are the paintings showcasing the various tourist attractions in our country such as landscapes and festivals. No two paintings are alike which means each room has its own character. 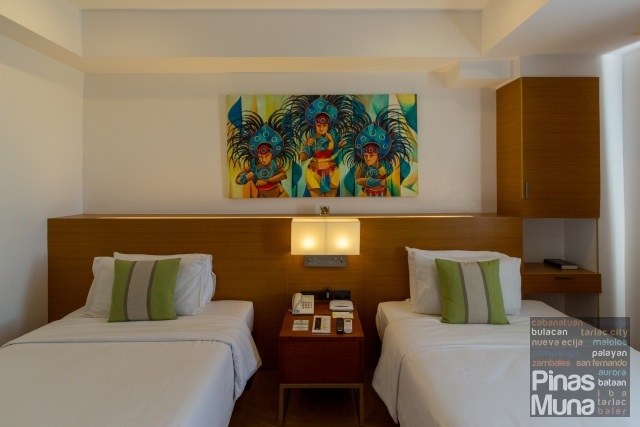 Our room for example features a painting of Dinagyang Festival of Iloilo City. The beds were very comfortable, and so were the pillows. The linens were made of high threadcount cotton and were very smooth to the touch. 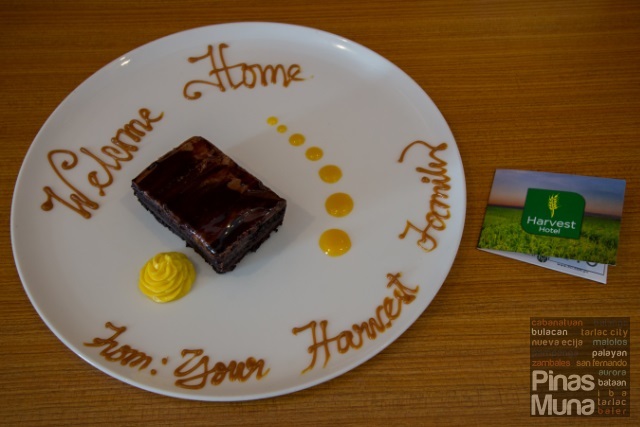 I had eight hours of uninterrupted sleep every night of our stay at The Harvest Hotel. The bathroom is also comfortably spacious. It was clean and well maintained. There's a walk-in shower installed with a rainfall and handheld showerheads. Hot and cold shower is available. Clean and high quality cotton towels were provided, as well as The Harvest Hotel branded toiletries. The toilet was also fitted with a bidet. 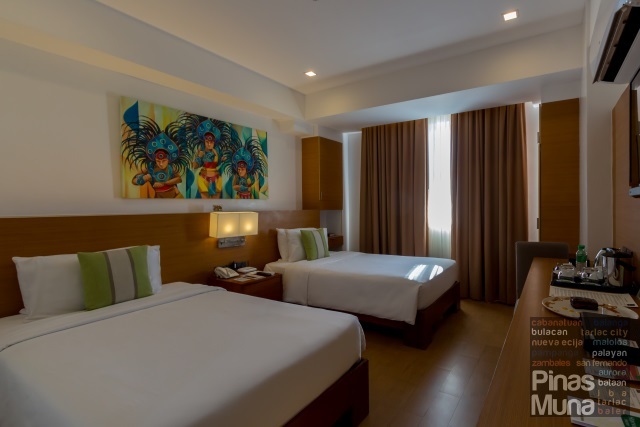 The Standard Room is also available in a Queen bed configuration also measuring 29sqm. 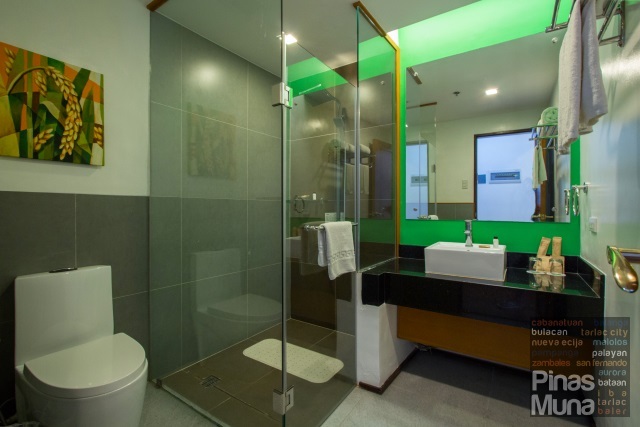 The next higher room categories are the Executive Suite (38sqm) and the Honeymoon Suite (58sqm). 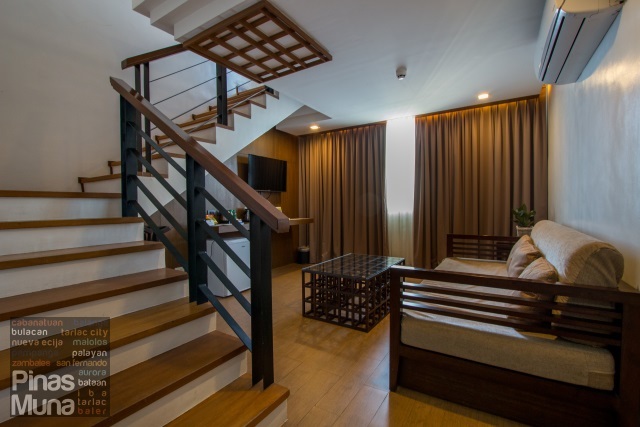 During our stay at The Harvest Hotel, we also got the chance to view the biggest room category, the Loft Suite 2 (81 sqm). 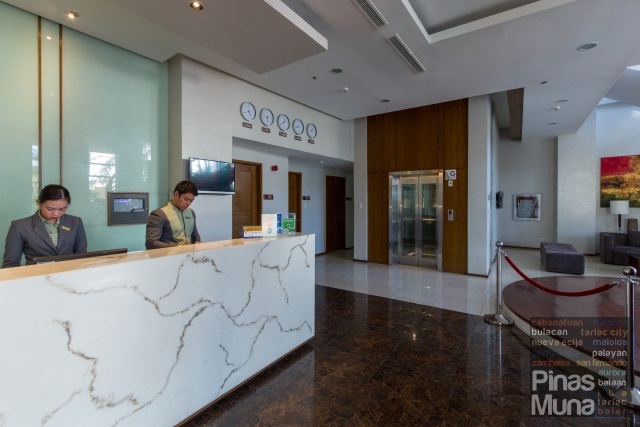 The Loft Suite 2 is a three-floor unit starting with the living area which is equipped with a sofa, an LCD television with cable channels, a minibar and a coffee and tea making facility. There's also a bathroom on the ground floor. Moving upstairs to the second floor which is furnished with a Queen bed. The area is decorated with a painting of the vintas of Zamboanga. The second floor of the loft also has its own bathroom. Next to the bathroom are the stairs leading to the third floor of the loft. It is furnished with a King bed, a writing desk, an LCD television, and a minibar. 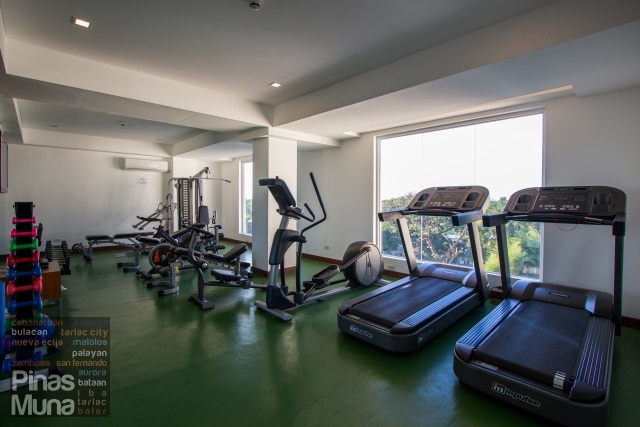 Guests staying at The Harvest Hotel get to enjoy complimentary use of the hotel's facilities, such as the gym. The streets within the city are not really safe for jogging due to the high traffic of vehicles, specifically tricycles. It is most recommended to use the work-out machines inside the gym. Located on the ground floor is the hotel's outdoor swimming pool. 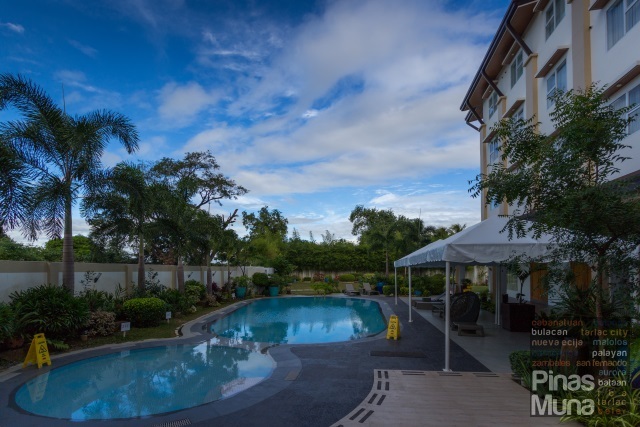 If you will be visiting Cabanatuan during the summer months, an afternoon swim will be a great idea to escape the summer heat. The pool is generally safe for children, but parents should always look after the kids at all times as the pool has no lifeguard on duty. 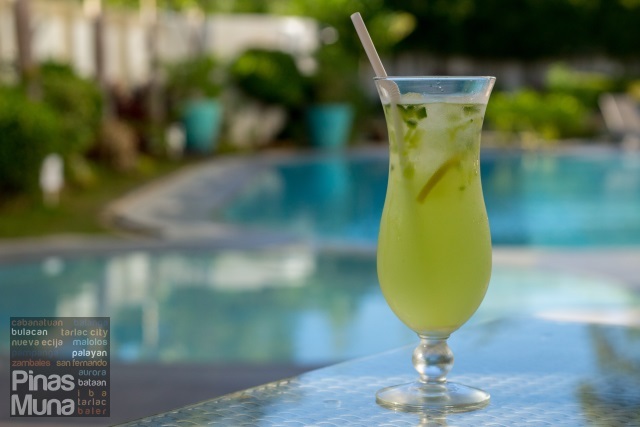 Another way to enjoy your afternoon swim is to order refreshing drinks from the restaurant. 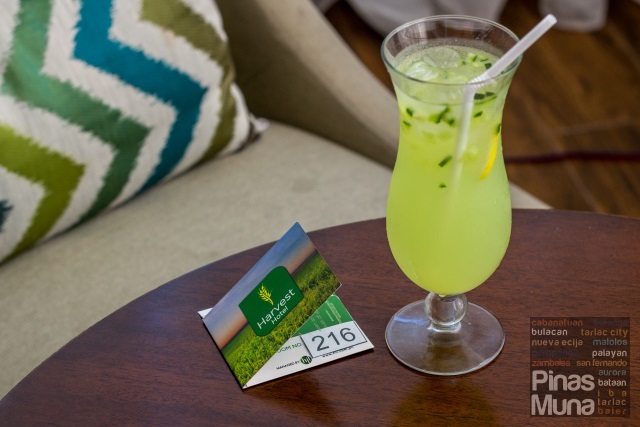 You can choose from chilled fruit juices, iced teas, sodas and bottled beer products. Towels are also provided at the pool area, so no need to bring down your bathroom towels. 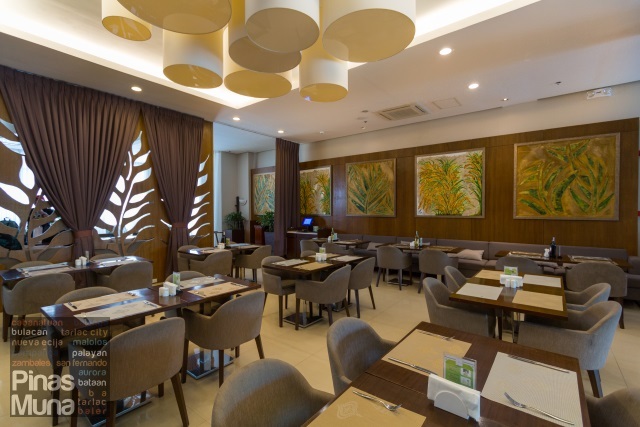 Café Ecija is the hotel's in-house restaurant that serves local and international cuisines. 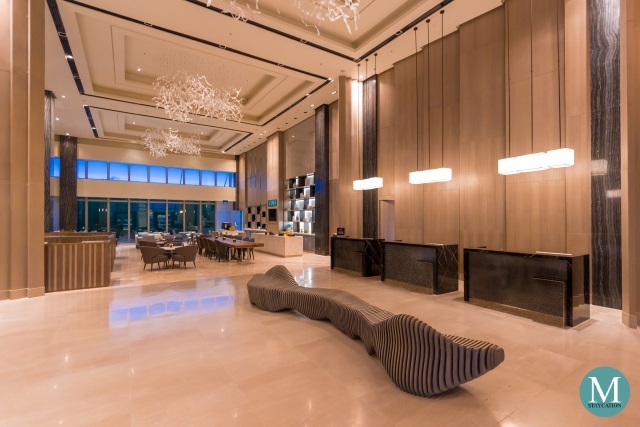 The interior of the restaurant is filled with design elements depicting a bountiful harvest of rice. Rice is the primary crop of Cabanatuan which makes it one of the rice graineries of the Philippines. The wall, for example is decorated with paintings of the rice crop, while the divider wall is carved with holes in the shape of rice grains. 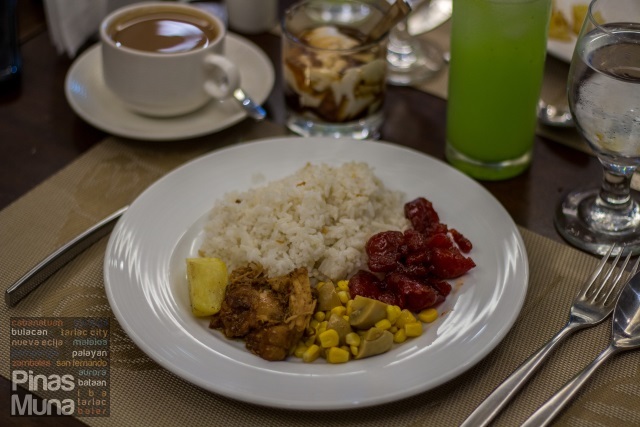 During our weekend stay at The Harvest Hotel, we were able to sample some of the specialty Filipino dishes served at Café Ecija. 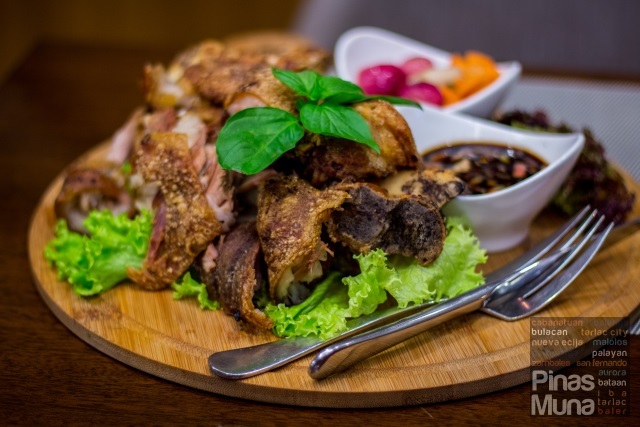 We started our dinner with the classic Filipino dish, Crispy Pata (P499.00) The skin was super crispy while the meat was tender and very flavorful. The dipping sauce had a well balanced mix of soy sauce and vinegar plus various aromatics which helped bring out the flavor of the dish. 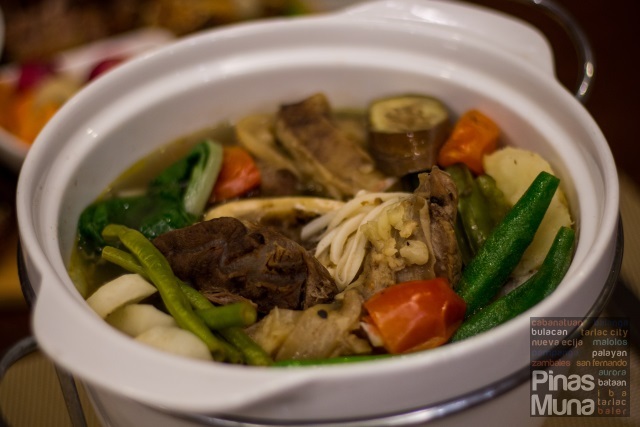 The next dish served to us was the Beef Buko Sinigang (P498.00) It is an interesting fusion of Bulalo, Binakol and Sinigang. 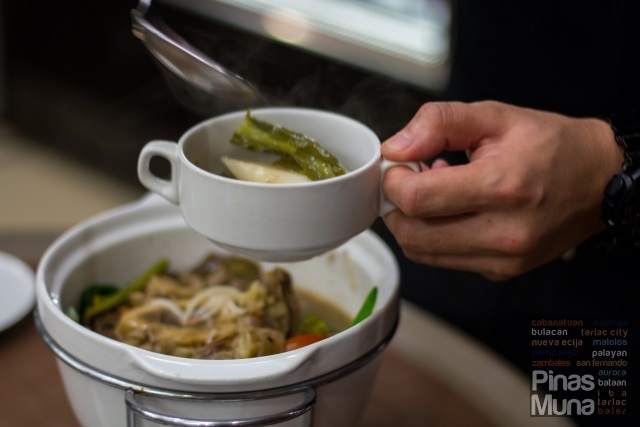 The dish uses the same part of beef used in Bulalo which is then boiled with coconut water and shaved coconut flesh, and flavored with spices and a secret souring agent. Fresh vegetables such as petchay tagalog, sitaw, sigarilyas, okra, labanos are then added to the dish. 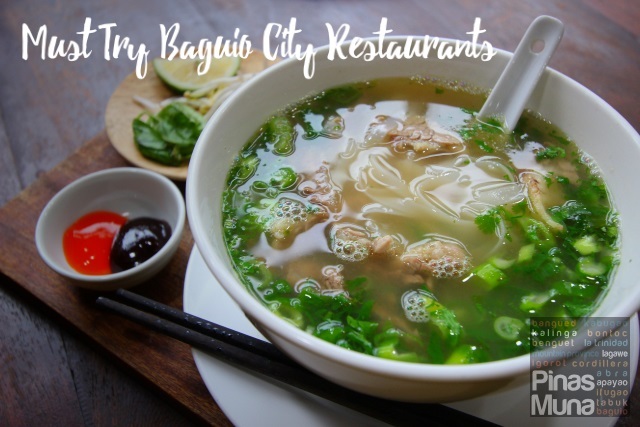 The result is an addicting broth with a savory Bulalo flavor with hints of sweetness and punch of Sinigang. 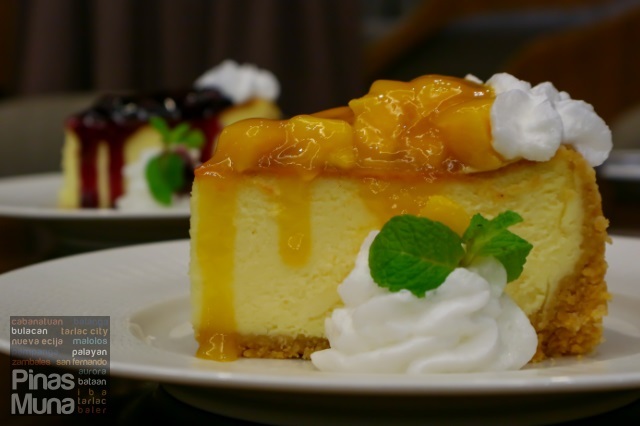 Finally for dessert, we had Mango Cheesecake (P198.00) and Blueberry Cheesecake (P198.00). Both cheesecakes had a rich cream cheese taste with a texture that is not too dense, and were generously topped with preserved fruits. Other flavors available are strawberry and cherry. All dishes served at Cafe Ecija are at very competitive price and are good for sharing. The great quality of food is complemented by the high level of customer service delivered by the staff. Cafe Ecija definitely deserves a spot on the culinary map of Cabanatuan City. 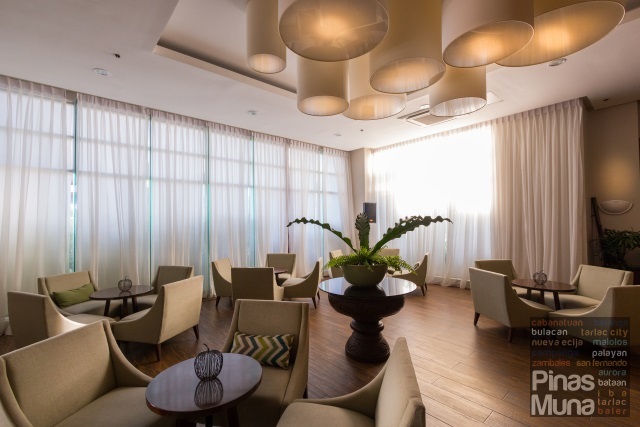 An overnight stay at The Harvest Hotel also comes with complimentary breakfast buffet for two persons at Cafe Ecija. 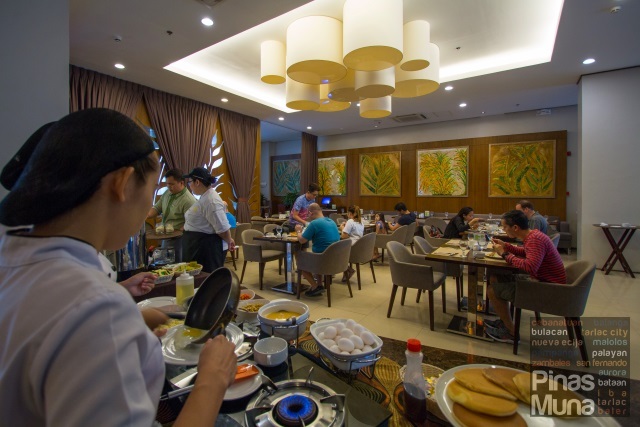 The restaurant mainly serves Filipino dishes for breakfast, with a few continental items to cater to the hotel's foreign guests. 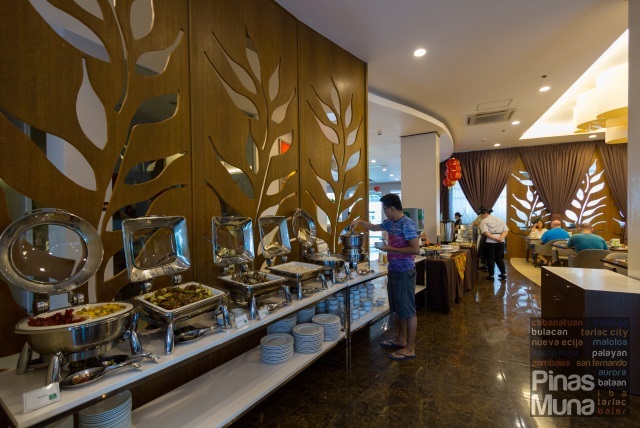 The buffet spread includes a soup dish, four to six main dishes, rice and fried rice. Pancakes and omelettes are served at the egg station and are cooked a la minute. There's also a separate station for breads and jams, as well as fresh fruits. We started our mornings with heavy breakfast at Cafe Ecija. One of our top favorites is the Batutay Longganiza, a product of Cabanatuan made of beef meat and flavored with sweet syrup. I also loved the Tocino and the Daing na Bangus. Special thanks to Edam for making sure that we always have coffee in our cups and for serving us sliced watermelons to end our breakfast. 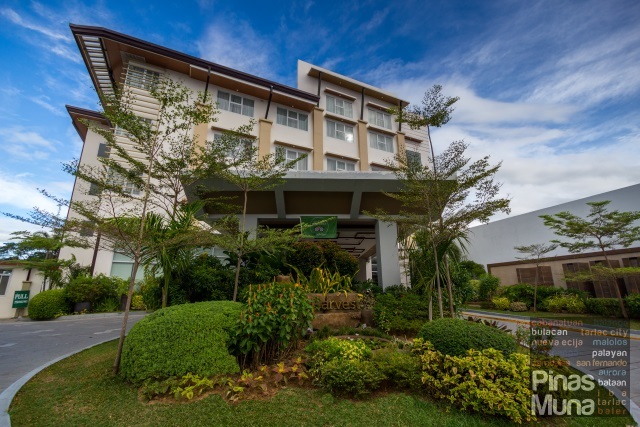 The Harvest Hotel is definitely the best choice of accommodation in Cabanatuan City. It is conveniently located in the city center where everything is accessible. Sleep quality is excellent. Room rates are very affordable. 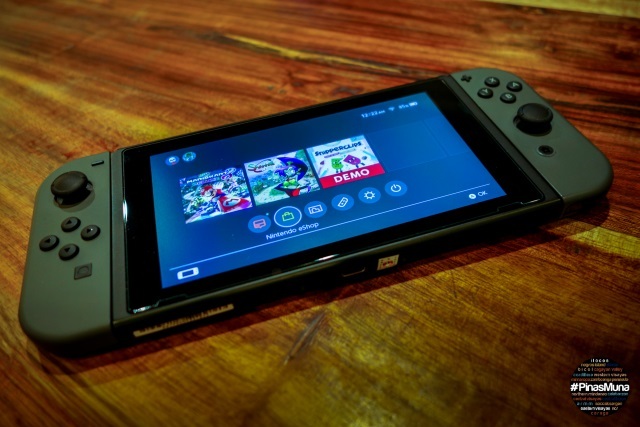 Customer service is consistently outstanding. Food is sumptuous and appetizing.